Protesters threw smoke bombs and other objects at officers, and started hitting the windows of a police van. Riot police then retreated, as did a water cannon, with protesters kicking the side of the large lorry. Later, the water cannon unleashed bursts from a side street to try to push protesters back. A burning vehicle was seen nearby. 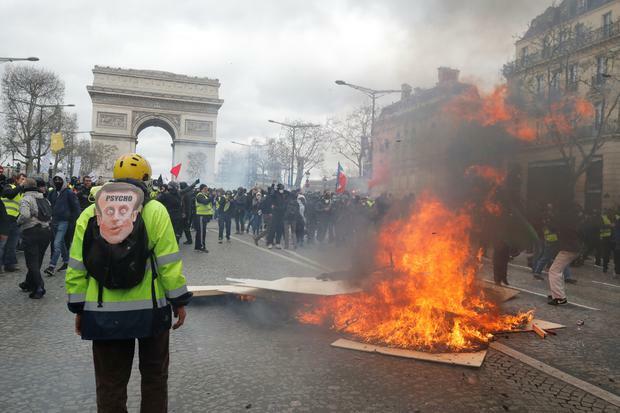 Police have announced 20 arrests already as protesters try to breathe new life into their movement against Mr Macron and his policies. After dwindling numbers in recent weekend protests, yellow vest groups organised dozens of rallies and marches on Saturday in the capital and around.